NOT INTENDED FOR USE BY PERSONS UNDER THE AGE OF 18. KEEP OUT OF THE REACH OF CHILDREN. If you are pregnant, breast feeding, have known medical conditions (including kidney or liver disease) or are taking prescription or OTC medication(s) consult with your health care practitioner before using this product. How many calories are REALLY in a BCAA? It's only been theoretical up to this point so Dr. Doug Kalman of The ISSN exploded some NutraBio to find out! Jul 10, 2017 NutraBio BCAA 5000 Re-Ignites with New Flavors! NutraBio BCAA 5000 is the no-nonsense BCAA! They've re-ignited their straightforward 5g branched chain amino acid supplement with three new flavors. Strawberry Kiwi was great, but Mike liked Pina Colada even more!! Lemon Lime is great if you want it simple, too, but we liked the fancy flavors more! Watch Mike take down the unflavored version to prove that BCAAs like this (that don't added glutamine, citrulline, alanine, glycine, etc) are fine for keto dieters! But you may want to toss in a bit extra NutraBio Leucine! Third Party Lab Test Results Available! We are all familiar with the expression "If it looks like a duck, swim likes a duck, and quacks like a duck, then it probably is a duck." What does this have to do with BCAAs you say? The fact is most BCAAs found in supplements are derived from duck feathers; and in some grotesque cases human hair. If the thought of that makes your stomach turn upside-down consider this. 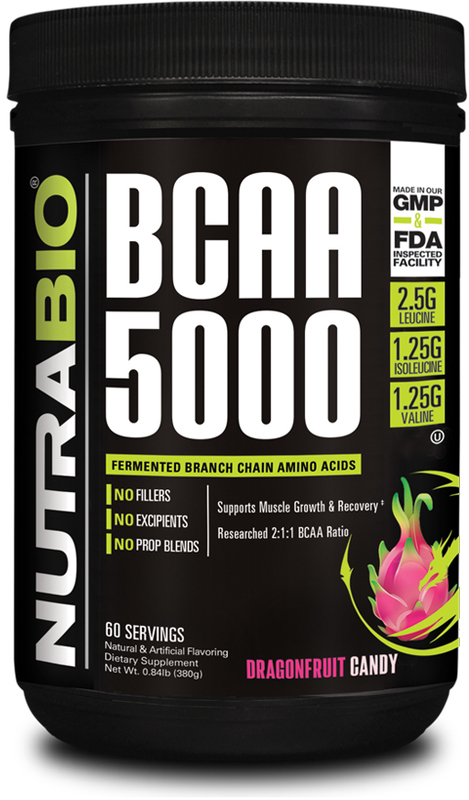 The BCAAs found in NutraBio BCAA 5000 are all 100% vegetable based and are manufactured through natural fermentation. What's more, except for flavoring, they have no additives, fillers, or excipients. With BCAA 5000, you make no sacrifices – you get proven and powerful muscle building BCAAs, without the junk. We pride ourselves on purity. Each of our BCAA is independently lab tested for purity and potency. What you see on the label is exactly what you get. BCAA 5000 contains no fillers, excipients, proprietary blends, or other potentially unhealthy or unneeded additives. Do you know where your supplements are made? Do you trust the raw ingredients found in them are really what they are supposed to be and are scrutinized for contaminants before going in to a final product? Unlike 99.9% of our competitors, NutraBio BCAA 5000 (and for that matter all our products) is developed in our own GMP certified and FDA inspected facility. This way, we can monitor every step of manufacturing from start to finish, to ensure the highest quality BCAA supplement is made without compromise. If that wasn't enough NutraBio uses FT-NIR Spectroscopy to initially analyze every raw ingredient that comes into our manufacturing facility. Every ingredient we receive is immediately quarantined and put into a separate warehouse where it will remain until our Quality Control lab analyses it for identity, purity, composition and potency. The first level of analysis tells us if the ingredient is what it's supposed be. NutraBio's ingredient qualification program is rigorous and absolutely no ingredient goes into our supplements unless it passes stringent testing to meet our demanding specifications. NutraBio is a name you can trust when it comes to clean and effective supplements. Since 1996 we have been setting the quality standard in the world of sports nutrition. Although the industry makes it seems like non-proprietary blends, proper dosing, and scientifically backed ingredients are something new; the fact is NutraBio pioneered this trend over two decades ago. We have always been the innovators; not the imitators. What is the best way to take BCAA 5000? Mix one scoop of BCAA 5000 into 16 ounces of cold water or favorite beverage and consume 2 times/daily. For best results take BCAA 5000 between meals to optimize muscle protein synthesis. Do I really need to take BCAAs? Can't I just get them through my diet? How do BCAAs help during training and recovery? 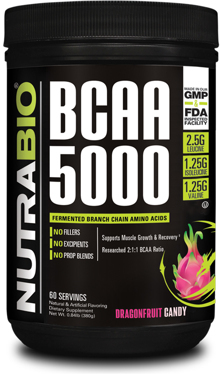 What other NutraBio products would you recommend taking with BCAA 5000? What makes BCAA 5000 better than other branched chain amino acid supplement?